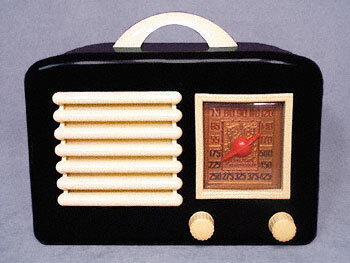 General Television and Radio Corp of Chicago, Illinois made this marvelous tabletop radio, known as Model 5A5. The cabinet is made of rich Bakelite, with beautifully contrasting ivory-covered top handle, grill, knobs, and face frame. The gold face features a stunning textural deco pattern, with a red plastic Saturn shaped station indicator, beneath which "General Television" appears. Measuring 8-5/8" wide, 5-1/2" deep, and 7" tall (including the handle), the back cover is unusually well marked and includes a circuit diagram and tube location on the reverse side. An interior metal plate, which is visible from the outside, indicates that it was "licensed under patents of Radio Corporation of America and associated companies and with Hazeltine Corporation". The radio works quite well, and uses a self-contained loop antenna. The face still lights, and we believe the cord and old round plug to be original. It is impeccably clean and in near mint condition.